Click above image for larger version. This is a simplified diagram and description of my new ”S.E.M. Multi-Detector Color Synthesizer” (U.S. Patent No. 5,212,383 and others) designed, developed, and built by D. Scharf. This system uses multiple secondary electron detectors which share the electron emission from the sample. Each detector’s signal is encoded with an arbitrary color using a signal mixing system. The R. G. B. signals from the mixer are then sent to an A/D (analog to digital) converter to facilitate acquisition in digital format. The resulting color complexity and shading enhance perception of depth and interpretation of the subject’s topography. The new images are purely digital and never passed through an optical lens. 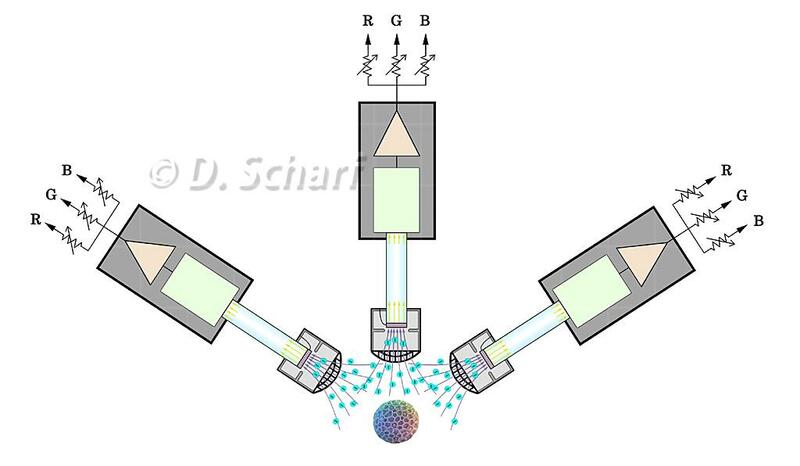 This illustration demonstrates the process of color image formation using the Scharf S.E.M. Multi-Detector Color Synthesizing system (U.S. Pat. No. 5,212,383).